It is well known that vegetables are very good for you. They are packed full of vitamins, minerals & antioxidants and eating them provides many benefits. Dark green vegetables are some of the healthiest foods that you can eat and regularly including them in your diet is a very good idea. They contain large amounts of chlorophyll, the pigment that not only gives them their deep colour but is also great for the human body. Here the top dark green vegetables that you should be eating. Broccoli is a member of the brassica family and probably one of the first vegetables that you came across. As a child, you either loved or despised the taste, there was no middle ground. Well that was the case for me anyway! A cup of raw broccoli provides you with all of your daily requirement of vitamin C & K, both of which are required for numerous bodily processes. Vitamin C keeps your gums healthy, assists with iron absorption and is needed for wound healing, whereas vitamin K helps blood clot and strengthens your bones. The consumption of broccoli reduces your risk of cancer, improves heart function, boosts vision and ensures that your digestive system is in tip-top shape. Also, a cup only has 31 calories, making it a great weight loss food. Often considered to be the healthiest food on the planet, this leafy vegetable is highly nutritious and should definitely have a place on your plate. Whilst most of the kale available is green in colour, purple varieties are available as well. When people think about vitamin A, they picture carrots or sweet potatoes in their mind. But did you know that just one cup of kale provides you with double your daily requirement? This is great news because vitamin A is extremely important and is needed for the health of your skin, eyes and hair. Kale also contains the antioxidants quercetin and kaempferol, which protect cells in the body from oxidative damage caused by free radicals. This in turn helps to reduce inflammation and fights off a large number of diseases. Also known as pak choi, bok choy is a type of Chinese cabbage and is a big part of Asian cuisine, but is becoming increasingly popular in other parts of the world. If you ask at your local supermarket, you should be able to find it. Besides vitamins A, C & K, bok choy also contains significant amounts of the B vitamins, calcium, iron, potassium and manganese. All of these nutrients play numerous roles in your body. Bok choy can be used in lots of different ways and incorporated into many delicious recipes, including stir fries, salads and rice based dishes. Whenever I used to buy beets, I would keep the root but throw the greens away because I didn’t think they had any nutritional value. But I couldn’t have been more wrong. These greens when cooked are a fantastic source of the vitamins and minerals mentioned above, together with copper, magnesium & zinc. A healthy way of preparing them is to roast the root and saute the greens, as per this recipe. You can also use the greens in soups, smoothies and salads. The beautiful pink, green, yellow and white stems of the Swiss chard leaf are reason enough to keep them in your kitchen. In terms of nutrients, it has a similar profile to other leafy greens and is one of the best plant based sources of vitamin K that there is. Swiss chard is rich in antioxidants, which slow down aging. Its consumption may also reduce the risk of diabetes and maintain healthy brain function. Swiss chard is widely available during the summer but can also be bought at other times of the year. It has a bitter flavour when raw, so you may want to cook it before eating. Another leafy vegetable, collards have large dark green & oval shaped leaves. 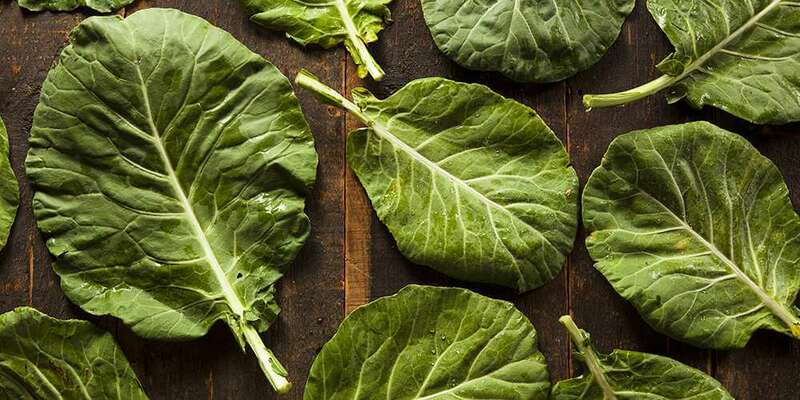 You may be surprised to learn that when cooked, a cup of collard greens provides you with 4 – 5 g of protein, making it an excellent source for vegans and vegetarians. It also provides you with a quarter of your daily requirement of calcium. This mineral is not only crucial for the health of your bones and teeth, it also helps you to maintain a healthy weight and improves sleep quality. Like Swiss chard, collard greens are quite bitter so it is a good idea to cook them before eating. They can be stir fried with garlic, ginger, tomatoes and onions or simply steamed and eaten as a side dish. Not all types of lettuce are dark green in colour. For example, iceberg lettuce has a light greenish-yellow shade and is the type that is often found in burgers and wraps. Romaine (also known as cos) lettuce is much darker and has a deep green hue. A pattern you will notice is that leafy greens are very high in vitamins A, C & K, and romaine lettuce is no different. Besides adding it to your favourite sandwich, you can also use it as the base for lots of salad recipes. It goes well with avocados, strawberries, artichokes, potatoes and pears. Would you have ever guessed that you have so many different choices when it comes to dark green leafy vegetables? Well now you do! Mustard greens are another great option that will add even more variety to your diet. They are enjoyed all over the world and are found in African, Indian, Japanese and American cuisine. Besides the leaves, you can also eat the stems and seeds of the mustard plant. A cup of cooked mustard greens only has 21 calories, which is incredibly low when you think about the number of nutrients that it provides. Like other leafy greens, eating it can be highly beneficial for weight loss. Parsley has a unique flavour that is unlike any other food. Its aroma would be best described as ‘refreshing’. It comes in bunches with long thin stems & small green leaves, and is cultivated as a herb, vegetable and spice. A cup of raw parsley provides you with more than 1000% of your daily requirement of vitamin K. Rest assured that the third zero is not a writing error, I checked 3 times! Whilst its unlikely that you will regularly eat a cup of parsley, including small amounts every now and then will allow you to reap the health benefits that it has to offer. Parsley works great as a garnishing and can be sprinkled over lots of dishes. You probably learnt about the goodness of greens by watching Popeye’s muscles grow when he ate can after can of spinach. Whilst doing the same might not increase the size of your biceps, studies have shown that eating spinach can enhance muscles. Savoy spinach is the type that has dark green leaves that are crinkly & curly and is commonly found in the grocery section of supermarkets. Spinach is great because it has a very mellow flavour and is not overpowering. It is a perfect green to add to smoothies and works great with berries, bananas and mango. A cup of raw watercress only has 4 calories! The reason why is given away by its name. Watercress is made up of 95% water, which has 0 calories. Despite its extremely low caloric value, watercress is quite nutritious and even contains some unique cancer fighting compounds. You can grow your own watercress at home, all you need is a container with some water and a few watercress trimmings. As long as they get enough sunlight, you will have a constant supply of fresh watercress to enjoy. Also known as rocket, arugula has a peppery flavour and is a big part of the Mediterranean diet. It is used to prepare sauces, dips and salads. A great example is this salad made using arugula and chickpeas. Whilst it is not as nutritionally powerful as some of the greens mentioned in this article, it does contain a compound called erucin, which studies have shown may be effective at fighting against tumors. Dandelions have lovely bright yellow flowers, but are actually a type of weed that gardeners try to get rid of. What is less well known about dandelions is that the green part is edible. So the next time you are doing the gardening and come across one of these plants, don’t just dig them up and throw them away. Instead, wash the greens and add them to your supper! The dandelion plant has been shown to be able to fight leukemia cells and promote liver health.